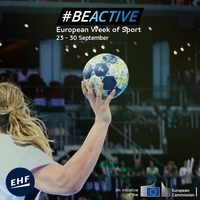 The EHF has invited all member federations to take part in the European Open Week of Handball as part of the #BeActive European Week of Sport taking place from 23 to 30 September. Federations have been asked to organise handball-related activities to inspire the public to get moving and experience sport in a friendly and supporting environment. 2017 saw a record number of participants in the European Week of Sport, with 14.6 million people taking part in over 37,000 events across Europe. 2018 is its fourth edition and the EHF has been a partner in all editions to date. This year’s opening of the European Week of Sport took place in Vienna and the EHF was well-represented. EHF President Michael Wiederer attended Saturday’s opening ceremony, where he met with EU Commissioner Tibor Navracsics, at the Austrian Day of Sport. The EHF's Senior Manager Education & Development Helmut Höritsch took part in the ‘Conference on the Economic Dimension of Sport’ and was also present at the week’s opening ceremony. Handball can be found throughout Europe during the Week of Sport, with street handball in Georgia, open sessions in Hungary, youth handball workshops in the Netherlands and a women’s open day in Ireland just a few examples which highlight the diversity of handball activities people can participate in. Events have been registered in 32 countries across the continent and a list of events can be found here, while the official Facebook event will also publish ideas and tips on how to #BeActive during the week and beyond.